An Evening of Exploring Ministry on Sunday, March 31, 6:00–9:00 PM. 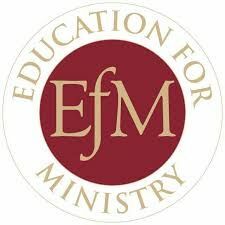 Beginning with a light dinner and fellowship, the evening will then feature a discussion by EfM alumni about how the program helped them discern and pursue a calling. A group theological reflection will follow on the topic of understanding ministry in a multicultural world. Participants need to bring only an open mind. Annual Traditional Seder on Saturday, April 27, 2:00–5:00 PM. The group holds this event each Passover to better understand and honor Christianity's Jewish roots. Attendees will be asked to help provide liturgical and fellowship food; a sign-up sheet will be sent in April. Both events will be at St. John's Episcopal Church at 415 S. Lexington Street, just off of Carlin Springs Road. Please RSVP to EfM mentor Beth Cavey at 703-362-4331. Feel free to direct questions or comments either to Beth or to Mary Cushing (an EfM group member).